If you ask me, gongfu tea is the best method for brewing loose leaf teas. Brewing tea in the gongfu style reveals the depth and complexity of flavor inherent in quality loose leaf tea, as the nature of the tea changes with each steep. Certain types of tea in particular (black tea, puerh tea and oolong tea) are known for sustaining multiple brews/steeps/infusions (you’ll see these words used interchangeably). Not only that, but many teas are actually meant to be brewed and consumed in this fashion. To do otherwise is to erase all the time and effort that went into making the tea itself. For some teas, it’s a shame to throw some leaves in a cup, drink it once, and be done with it. It’s like you’re only listening to the wind section at a symphony and ignoring the rest of the orchestra. The “gongfu” in gongfu tea has nothing to do with kung fu or fighting of any kind. The Chinese term gongfu in general terms describes something requiring time and skill to master. 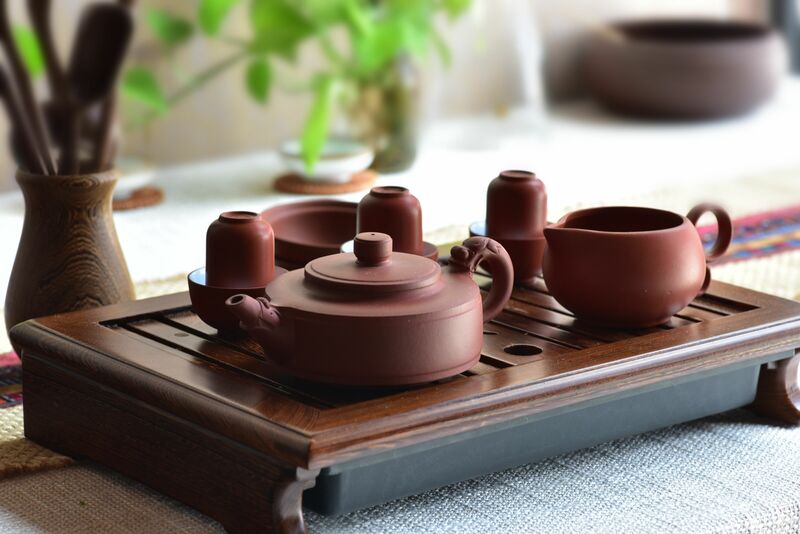 Gongfu tea is not the Chinese equivalent of the Japanese tea ceremony. Gongfu tea is not nearly as scary as it looks! 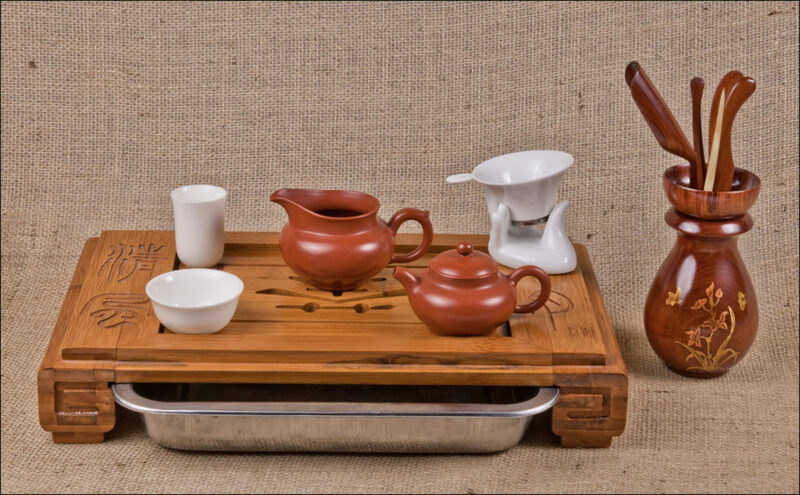 Yes, it can be a bit daunting when you’re staring down the barrel of a full gongfu set, but it’s actually easy to get started with a humble set of tea ware. Gongfu tea is (strong opinion incoming!) simply the best way to enjoy certain types of Chinese and Taiwanese loose leaf teas. Gongfu tea is easy to get into if you know a few of the basics. Gongfu is an exploratory process that will help you learn about every aspect of your tea. From water, to brewing time and temp, to the way tea flavor develop with subsequent brews, there is a whole world to explore with gongfu tea! Which teas can I brew gongfu? Technically you can brew any tea gongfu style. From white to black and everywhere in between, some believe any and every tea is improved with gongfu brewing. I have personally experimented with every variety of tea on offer and each tea has something different to offer. That said, if you want a general rule of thumb then oolong, black, and puer teas are your best bet for brewing gongfu style. Jin Xuan oolong from Alishan. Was good, not great. My fault, I think. Still haven’t nailed the brew pattern. You’ve convinced me. How do I get started? A way to make hot water. A variable temperature kettle is the most ideal, but they’re generally not cheap so with a little patience any garden variety electric kettle will suffice. A tea pot of any almost any kind. Try to keep it on the smaller end of the spectrum (~2-4 ounces, or 60-120mL would be best) because brewing tea for one with an 8 ounce tea pot is a lot to drink by yourself! Some kind of straining device (some kettles have this built in) to keep leaves from pouring out of the brewing vessel into your cup. A drinking vessel. Any kind of cup suited to drinking hot liquid works. Ceramic is good but clear glass cups are also nice because they allow you to enjoy the color of the tea liquor. The drawback with glass is it cools quickly (unless it’s insulated), which can leave your tea lukewarm if you don’t drink it quickly. Fresh spring water is best, but filtered water will do. Avoid tap water unless you live somewhere with good water. I use a simple PUR filter pitcher to give my tap water a once-over before I use it to brew. These days I’m starting to play with bottled mineral water as well. Decent tea. I’m sorry, but your bagged tea will not suffice here. It’s actually shockingly inexpensive to get good quality loose leaf tea and can be very competitive in pricing with the bagged stuff when you price it out per cup. Check out r/tea’s list of recommended vendors to get started shopping. This will be you before you know it! I got the goods. What next? The process of gongfu is simple: lots of leaf and short steeping times. Put the kettle on to get the water started. I use a variable temperature kettle so I can set it exactly how I like it. Measure out the tea. I use a 1:15 tea-to-water ratio, so that’s 1 gram per 15 mL of water, or 2 grams per ounce of water, but you should experiment to see what you like best. When the water is ready, pour it into the brewing vessel (with tea in it) and immediately pour it out into my drinking cup. This is to “wake up” and clean the tea as well as clean and heat the tools. Discard the water. Pour more water into the brewing vessel. Most teas come with brewing instructions from the vendor so follow those. If not, a Google search will usually uncover various opinions on how it should be brewed. Pick one and try it. If you don’t like it, try something else. From here on out it’s pure experimentation. Sometimes I go with very rapid brews, sometimes I go with longer brews. I adjust to taste as I’m drinking. I used to be disciplined about keeping notes in a Google sheet (I love spreadsheets, tbh) but at this point I’ve developed a sense for what I like. Personally, I like to keep brewing until I feel the tea has lost it’s flavor. Sometimes that’s 2-3 steeps, sometimes it’s 4-5+. Puerh tea in particular is known for having a ton of mileage on it. If you’re ever wondering if you should brew another cup, do it and see how it tastes! The only way to learn the limits of your tea is to surpass them and then adjust accordingly (a tea journal comes in handy here, by the way). Read on below for some of my recommendations on gear to get started. What are your recommendations for gear? You really don’t need to be fancy in order to brew gongfu. A few simple items is all it takes to get started! Unless your tap water is high quality (no added chlorine, good balance of minerals, etc. ), I highly recommend against using tap water to brew tea. Tea is sensitive relatively slight changes in conditions of the water and a good way to skunk a cup of tea is with bad water. According to the ancient tea scholar Lu Yu, spring water is the best water to use. If you’re lucky you, might have access to a nearby natural spring you can use to fill up. Check out this nifty website to see if there are any springs near you. Hoping to get to try real spring water with tea in the near future. I’ll be sure to report back! I’ve discovered a couple brands of bottled mineral water that seem to go well with tea I like: Waiakea and Volvic. They’re both available from many grocery stores. You can even find Volvic on Amazon. However there is a cost component involved and it’s much more economic to buy a water filter (see below). A friend of mine told me a tea mentor told him (and so on) Alkaline water is best for brewing because tea is acidic so this water evens out the pH levels of the brew, resulting in an overall higher quality beverage. The International Tea Masters Association (ITMA) also discusses pH levels in water here. I have not put this through a rigorous taste test so take it with a grain of salt. My usual method. I have a filtered water machine at work and a simple PUR filter pitcher at home. You might try this 11-cup pitcher ($30 at time of post). More environmentally friendly than alkaline water (no bottle to discard) and much less troublesome than getting your own spring water, it’s definitely good enough in my experience. I use a Bonavita variable temperature kettle ($67 at time of post). It’s a little on the pricey side so if you’re balling on a budget any old kettle will do. You’ll just have to wait for your water to cool down properly. I use a meat thermometer in a stove-top kettle when I’m at my parent’s house without my gear, so don’t be afraid to improvise. The leaf-to-water ratio matters, so weigh your tea–at least until you’re more comfortable eyeballing it. Too little tea or too much water makes a thin and unsatisfying brew. Too much tea or too little water means the leaves can’t release all their goodness because the water saturates too fast. You also risk over-steeping your tea. I use this super easy (and super cheap) scale. I use a simple porcelain gaiwan, like this one. 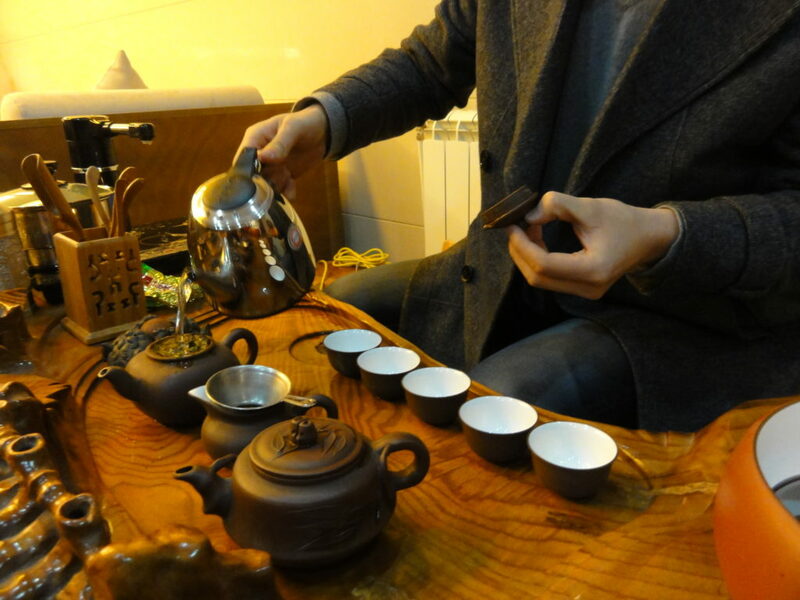 The gaiwan (Chinese for “lidded cup”) is one of the traditional brewing implements of gongfu tea. They can be very beautiful and fun to use! Check out this video for tips on how to use one. If you’re going to use a tea pot instead, try to aim for one in the 2-4 ounce range (roughly 60-120mL). Amazon appears to have ~4 ounces as its smallest size so don’t be afraid to branch out. Teaware House has a great collection of very affordable teaware so give them a look. When brewing with a teapot without a built-in strainer, it’s good to have some way to capture leaves in case they come out in the pour. To stop this, if your tea pot doesn’t have a built-in strainer then look at a strainer such as this one or this one. I do not recommend tea balls in general and especially not for gongfu tea. You’ll be using a high amount of leaf and it needs space to properly expand, which is something tea balls likely will not provide. You can drink tea out of literally any container that safely holds hot liquid but if you want my recommendation, try an insulated glass cup (small example set). I love these cups because they keep tea warm and allow me to appreciate the beautiful color of my tea. Make sure you get one that’s a suitable size for the amount of tea you plan on brewing! If you want something a little more visually appealing then get something that you enjoy. Again, Teaware House is great for this. I have a beautiful glazed clay cup from Yunnan Sourcing. If you have any questions, you can find me on Facebook, Twitter, Instagram or hit me up via the contact form.